While San-X continues to surprise us with many of their collaboration projects in the month of July, San-X has also released news on a Space collaboration with JAXA. JAXA also known as Japan Aerospace Exploration Agency (独立行政法人宇宙航空研究開発機構), is the national aerospace agency of Japan. 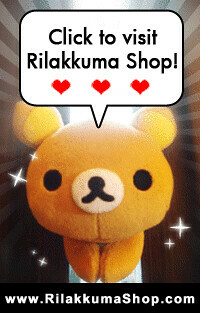 And this special Astronaut Rilakkuma plushie is set to be released at the SPACE EXPO 2014: The Great Challenge of NASA/JAXA together with Rilakkuma Space themed Series. Limited quantities will be released so fastest fingers first! Looking into the details, Rilakkuma is holding on to a rocket on his right hand and there is a Japan flag on his left sleeve. Judging from the suit, the blue suit seems to be detachable. Yay!! 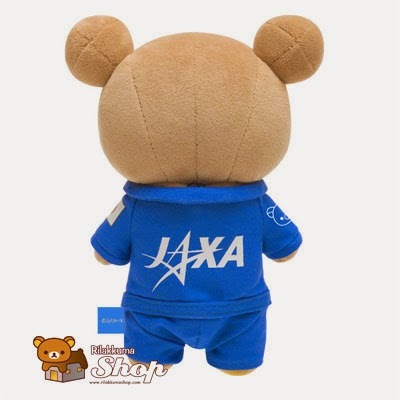 As this is a special release, the tag on Rilakkuma seems to be printed with JAXA logo. This plush is about 215 x 140 mm, which is about the size of a S plush. There is also a JAXA logo printed on the back of the suit. The whole professional look really made Rilakkuma like a real training Astronaut! Comparing this special release to the Space themed series, this plushie is more formal looking and it made us want to keep one for ourselves! 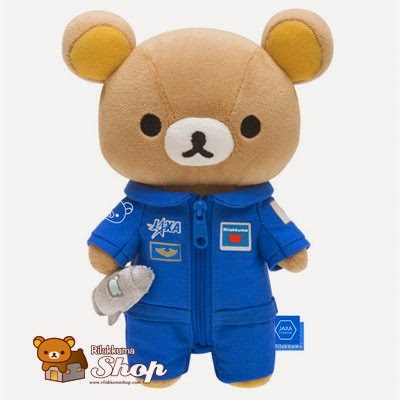 Although it is a bit sad that this release only consists of Rilakkuma, we would love to see Korilakkuma and Kiiroitori suit up as his space team mates as well. It will be so cool to see them all in the same suits! Perhaps, JAXA and San-X could also come up with Space Ice Cream or other food. We have also opened a pre-order for this plushis over at our webstore here. Pre-order will be closed on 17th July 2014.